BobbleRoos is a mom-owned and run business by Renee Sirulnik. She always loved sewing and creating things. Renee started off sewing baby blankets as gifts for her friends that were new moms and they loved them! They loved the generous size, the soft fabrics, and the cuddle factor. After starting a family, she decided to take the plunge to leave her job in the computer field and focus on her family and her Bobbleroos business. Bobbleroos now has customers in all 50 states and many countries. Their products are also used in several daycare facilities across the U.S., as well as the in-room cribs at a Hyatt Regency hotel in the Washington D.C. area. Bobbleroos doesn’t just make baby blankets now. They have also added toddler pillows, playard sheets, washcloths, bips, burp cloths, nap mat sheets, and larger supersize blankets for older kids! I thought Bobbleroos would be perfect for a first birthday since Baby Boy will soon be able to safely sleep with a little pillow and/or blanket now! (As with many things related to parenting, the question of when to give your child a pillow is one with many different answers, and it is best to use your own best judgment based on the needs of your child. It is not recommended before the age of 1 1/2.) 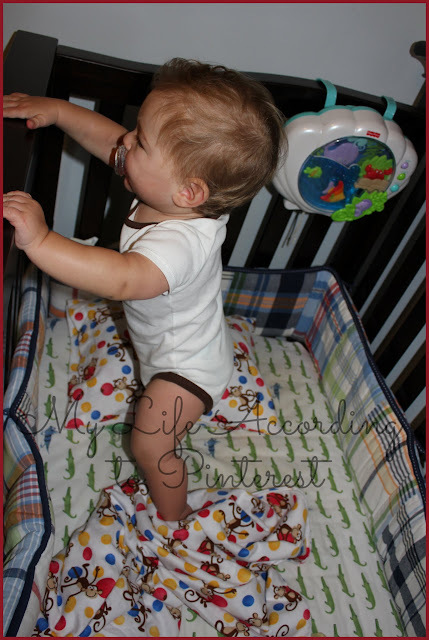 Renee generously sent me the Toddler Pillow and Blanket Set in Playful Monkeys for review. This set features one toddler pillow with a matching standard size (35" x 44") baby blanket that is larger than most blankets and will last your child all the way into toddlerhood. Our blanket was a great size. Folded in half it was big enough to cover up Baby Boy and unfolded all the way it was a very generous size. You child could definitely cuddle up nicely in this blanket! The fleece fabric was not only cute, but ultra soft. Bobbleroos even included a special card that told you the best way to wash and care for your new flannel blanket and pillow case to keep it in the best condition. I haven't let Baby Boy sleep at night with his pillow or blanket yet, but he loves to cuddle up on it when he's awake! He loves pillows and thinks is so fun to lay his head down on them when we are playing. (He's a funny kid!) I think these will be perfect for him as he grows! The pillow and blanket set are also great to take with you while you're traveling or even to daycare or grandma's house for nap time. This toddler pillow/blanket set would also be a great gift item! It can be personalized with your child's name to make it extra special. Follow & Connect: Like Bobbleroos on Facebook or follow them on Twitter. Buy It: You can purchase your own toddler pillow and blanket set on the Bobbleroos website. Win It: Come back in September to enter to win your own toddler pillow and blanket set in your choice of fabric (based on availability) during the "One-derful" Birthday Bash! These are adorable! My daughter absolutely loves laying on our pillows & covering up with blankets. She would get the biggest kick out of this set! Bobbleroos has amazing pack-n-play sheets that cover the bottom of the pack-n-play and don't come off. We loved them! I'm glad you discovered them as well. Oh my my daughter is doing her nursery in monkeys this is so darn cute. Cute! I would love to get a set like this for my daughter as we just turned her crib into a "big girl" bed. What a super cute sweetie your Baby Boy is! The blankie (as my girls called theirs') and pillow set is adorable. I love the "monkey" fabric! I'm so glad I came upon this review. I've been looking for a toddler pillow for my son. I think he's about ready for one. I love the cute prints. What a cute little pillow! My son would love these! You did a great job on the review. I like that they can be personalized. Cute set and it looks soft and not scratchy. This would be a great gift set for baby shower gifts. Love this! My 2 year old would love this as well! I have been the "nothing in the bed but a light blanket" momma up until a few months ago and he loves having his stuffed animals with him now. I am certain the pillow would be a BIG hit! I never thought of a pillow specifically made for a toddler! What a sweet idea, I love it!